St. Alban's Lodge, Toronto, was instituted on the 16th of June, 1913, by M.W. Bro. Aubrey White, Grand Master, who was assisted by a large number of distinguished brethren. R.W. Bro. F.W. Harcourt, K.C. was placed in the Chair as the Worshipful Master. The workings of the Lodge, while under a Dispensation, were most successful. Having had its Warrant granted at the meeting of Grand Lodge held at Niagara Falls, Ontario, in July, 1914, the Lodge was constituted and consecrated by M.W. Bro. W.D. McPherson, K.C., Grand Master, on October 19th 1914. On this occasion the lodge room was beautifully decorated and many prominent brethren were present, including many of the Masters of the city lodges. St. Alban, the name selected for the Lodge, is an interesting one in Masonic lore and was well chosen. St. Alban was proto-martyr of England, as the legend sets forth. He was born in the third century at Verulanium, now St. Alban's, in Hertfordshire, England. In his youth he visited Rome and served seven years as a soldier under Emperor Diocletian. On his return to Britain he embraced Christianity, and was the first who suffered martyrdom in the great persecution which raged during the reign of that Emperor. Freemasons of England have claimed St. Alban as being intimately connected with the early history of the fraternity in that country. In an old manuscript it is said: St. Alban loved Masons well and cherished them much, and made their pay right good; for he gave them two shillings per week and four pence to their cheer; whereas before that time, in all the land, a Mason had but a penny a day and his meat until St. Alban mended it. And he got them a charter from the King and his Council for to hold a General Council, and gave it to name Assembly. Thereat he was himself and did help to make Masons and gave them good charges. If the brethren of the Lodge will live up to the ideals so beautifully exemplified in the life of the proto-martyr, St. Alban, then will they truly be Masons in spirit as well as in name. I set about preparing this Short History of my Mother Lodge, Bay of Quinte Lodge No. 620, I began with material that I have as the present Secretary of Quinte St. Alban's Lodge. This includes a booklet prepared for the fiftieth anniversary by the late V. W. Bro. R. W. (Shaw) McEwen, P.G. Dir. Of Ceremonies, who was the Historian of Bay of Quinte Lodge at that time. I was also greatly helped by material left by the late R. W. Bro. John R. Williams, P.D.G.M. For a long time prior to his death in 1995 he had been carefully collecting relevant information, with the intention of updating the history of the Lodge. What he left us has proved invaluable. I have also been indebted to W. Bro. Brian Aubrey, Past Master of St. Andrew's Lodge No. 16 for additional information on our first Worshipful Master, V. W. Bro. George A. Kingston, who was Worshipful Master of St. Andrew's Lodge No. 16 in 1907, and whose Past Master's jewel W. Bro. Aubrey now wears. Finally, I am grateful to my wife, Jean, and to my late father, W. Bro. Fred Nichols, as well as others in the Lodge, who provided information and did research for me. Without their assistance, preparing this History would have been impossible. In October 1955, the late V. W. Bro. H. Babbit prepared a document "The Early History of Bay of Quinte Lodge." Because of its relevance, much of its material has been included in this paper. Some thirty two years had elapsed since Bay of Quinte Lodge was organized, and the Worshipful Master suggested that V. W. Bro. Babbit relate a few incidents in connection with its formation. First let us take a brief glance at the early history of the Craft in the home counties bordering on the Bay from which the Lodge took its name. Masonry first came to the district with the formation of St. James' Lodge in the King's Rangers Regiment at Cataraqui, now Kingston, in 1781. It received its warrant from the Provincial Grand Lodge at Quebec and worked till about 1812. The first Master was Major James Rogers and his Regiment was often called Rogers' Rangers. The Senior Warden was Captain John Walden Myers. Different spellings of the name appear in early masonic and military documents. It is interesting to note that twenty years later Captain Myers was the first Worshipful Master of Thurlow, now Moira Lodge at Belleville. He was also the founder of Belleville, having built a mill and started a settlement at the mouth of the Moira River, known as Myer's Creek. The name was changed to Belleville in 1816. The first settlers on the Bay of Quinte were Loyalists, and many were Masons. They entered an unbroken wilderness without roads except aboriginal trails, and faced untold hardship and great privations for the sake of their convictions. It is therefore to be expected that the Craftsmen among them would long for Masonic fraternity and as soon as possible would take steps to organize Lodges in their settlements. St. Johns', Kingston held its first meeting in August, 1794. A Lodge was formed at Fredericksburg the same year, and at Belleville in 1801, Bath in 1803, Picton in 1811, Napanee in 1812 and at Carrying Place in 1818. This last was "United Lodge" and later moved to Brighton, where it still works. These were the pioneer Lodges of the Bay of Quinte and the forerunners of the nearly forty Lodges working in the district today. The "County Lodge" movement in Toronto started about 1920 for the purpose of bringing together as Charter Members, the many brethren from the old home counties, living in Toronto, but not affiliated with any of the Toronto Lodges. It was thought that this would enable them to take a more active and useful part in Masonry and also strengthen the fraternal ties with the Lodges in the home district. Both the Craft and the individual members have benefitted from the movement. It was on the occasion of the Consecration of Grey Lodge on November 10th, 1922 that the suggestion for the organization of Bay of Quinte Lodge was first made. The Grand Master, Most W. Bro. W. N. Ponton conducted the ceremony and during his remarks at the end, spoke with enthusiasm of the forming of new Lodges such as Grey. Then addressing V. W. Bro. George Kingston from the chair, he said, "V. W. Bro. Kingston, couldn't you undertake the organization of such a Lodge here amongst Masons in Toronto from the Belleville District?" V. W. Bro. Kingston was greatly impressed by the Grand Master's suggestion and lost no time in acting on it. During the next few days he phoned and interviewed a number of brethren, and called an informal meeting for November 18th. The proposal for the new Lodge was favourably received and after some discussion it was decided to have another meeting on November 28th. Plans were made to canvas other eligible brethren and have them attend this meeting. The meeting on November 28th was well attended and a great deal of work was accomplished. The proposal to form the new Lodge met with a most enthusiastic response and it was decided to proceed at once with a petition to Grand Lodge for the formation of a Lodge to be named Bay of Quinte Lodge. The petition which was dated November 29th contained 62 names. V. W. Bro. Kingston was nominated and recommended to be the first Worshipful Master, V. W. Bro. Morden to be Senior Warden, and V. W. Bro. Wm. G. Neill, Junior Warden. It was decided that these officers together with the Past Masters should nominate brethren to fill the Subordinate offices for the first year. V. W. Bro. A. E. Jewett was our first Secretary and the early proceedings of our Lodge so carefully inscribed by him on the minute books is an all-time memorial to his zeal and efficiency. Plans were made to increase the list of Charter Members by interviewing as many other eligible brethren from the Bay of Quinte district as could be located in Toronto. Thus eighteen days after M. W. Bro. Ponton's suggestion to V. W. Bro. Kingston, Bay of Quinte Lodge had been organized and the required petition submitted to Grand Lodge. Other meetings were held and by the end of January 1923, the Charter List had reached a total of 165 members, over 100 of whom had not affiliated with any Toronto Lodge. This was said to be the largest Charter List ever presented to Grand Lodge. The list included 24 Past Masters, 10 of whom were either present or past Grand Lodge Officers. This large group of Past Masters was a great asset to the new Lodge. They were skilled Craftsmen, familiar with Masonic usages and ceremonies. On February 12th, 1923, the first summons was issued informing the brethren that the Most Worshipful Grand Master had granted a Dispensation to "Bay of Quinte" Lodge and that the Ceremony of Institution would be conducted by him on Saturday evening, March 3rd. The Institution was an outstanding event in the annals of Masonry in Toronto. Approximately 500 brethren attended, including 4 M. W. Bros., 17 R. W. Bros. and 70 ruling Masters of Toronto and District Lodges. M. W. Bro. Ponton was received with Grand Honours and requested to occupy the Master's chair. After congratulating the Lodge on the occasion, he assigned the duty of instituting the Lodge to the D.D.G.M., R. W. Bro. P. J. Lee. The officers were then duly installed and invested. At the session of Grand Lodge held in Toronto in July, our Lodge was granted a Warrant, the number to be 620. The Constitution and Consecration ceremony was conducted by M. W. Bro. Ponton on November 17th, 1923. It was another never to be forgotten occasion with 105 members of Bay of Quinte and 164 visiting brethren present. The ceremony and the banquet were unique, in that all the implements used in the lodge room, and the food at the banquet table, came from the Bay of Quinte district. V. W. Bro. George A. Kingston, the first Worshipful Master of Bay of Quinte Lodge, was born and raised in the Bay of Quinte district. He always took a keen interest in the development and growth of that section of the province. V. W. Bro. Kingston was a lawyer by profession and was associated for many years with the Workmans' Compensation Board. He took a leading part in its affairs and gave valuable guidance during its formation in the early part of the twentieth century. He was the Chairman of the Board before his retirement in the 1930s. Among his many achievements was the writing of poetry, and one of his poems was included in the 1938 edition of the Book of Common Praise," the hymn book of the Anglican Church of Canada. He died in 1943. V. W. Bro. Kingston had served as the Worshipful Master of St. Andrew's Lodge No. 16 in 1907, and was later appointed Grand Steward. He is looked upon as the father of the Lodge because of his keen interest in pilgrimages to lodges in the Bay of Quinte area. He arranged for the presentation of an item of lodge furniture on each occasion. 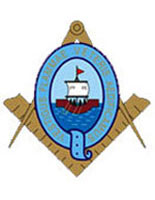 Over the years Bay of Quinte Lodge produced several notable Masons. In 1956 R. W. Bro. Arthur Langman, was elected Grand Junior Warden. Several members served as D.D.G.M. In 1943 the W. M. was W. Bro. William K. Bailey, an affiliated member who had been initiated in December 1925 in Sterling Lodge No. 69 in Hastings County. He subsequently served as D.D.G.M., then as a member of the Board of General Purposes, was elected Deputy Grand Master in 1969, and finally Grand Master in 1971. M.W. Bro. T. John Arthur, initiated into Caledonia Lodge No. 637, was an affiliated member who was very active in Bay of Quinte Lodge for many years. He was appointed an Honorary Past Grand Master in 1987 in recognition of his many years of service to the Masonic Foundation of Ontario. Quinte St. Alban's Lodge is the proud possessor of a portrait of this most distinguished brother. Through the 1990s it became more and more difficult for the Lodge to maintain sufficient membership for viability as a Lodge. Nevertheless, in 1998 a very successful observance of the Seventy-fifth Anniversary was held under the leadership of W. Bro. Kevin Anthony, the Worshipful Master at the time. In the year 2000 the Lodge began actively to seek amalgamation with another Lodge. In 2001 W. Bro. Alan Donovan was serving a second term as Master (he had served previously in 1988). He later became the last D.D.G.M. of Toronto District 3, before the Toronto Districts were realigned in 2006. On May 28, 2001, Bay of Quinte Lodge No. 620 amalgamated with St. Alban's Lodge No. 514 to form Quinte St. Alban's Lodge No. 620, and the final page was turned on a long history of distinguished service to Freemasonry in Ontario. By R.W. Bro. Ian D. Nichols, P.G.S.W.